Be prepared to make a $5 donation at door for entry. Must Be 21+ to Enter.Location: U St. NW Washington, DC. 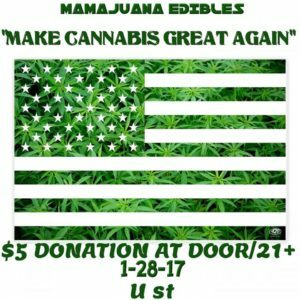 Mamajuana Edibles will host “Make Cannabis Great Again” Pop-Up event from 12p-4p on Saturday, Jan. 28th. The healing powers of cannabis have been well documented it’s time to make this amazing plant great again! Mamajuana Edibles will have cannabis-inspired items for sale with lots of delicious cannabis-infused edibles to giveaway. Cash only. This event is 420 Friendly, BYOW. Come see our other vendors who have amazing products. Anyone who wants to giveaway, share or exchange weed, seeds, buds, clones, trim or plants is welcomed. It’s legal in DC.